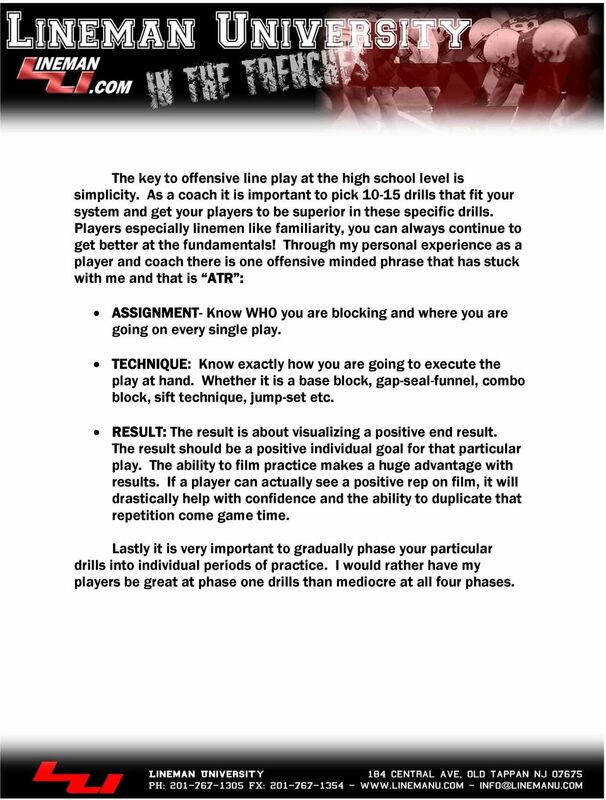 Download "ASSIGNMENT- Know WHO you are blocking and where you are going on every single play." 1 The key to offensive line play at the high school level is simplicity. As a coach it is important to pick drills that fit your system and get your players to be superior in these specific drills. Players especially linemen like familiarity, you can always continue to get better at the fundamentals! Through my personal experience as a player and coach there is one offensive minded phrase that has stuck with me and that is ATR : ASSIGNMENT- Know WHO you are blocking and where you are going on every single play. TECHNIQUE: Know exactly how you are going to execute the play at hand. Whether it is a base block, gap-seal-funnel, combo block, sift technique, jump-set etc. RESULT: The result is about visualizing a positive end result. The result should be a positive individual goal for that particular play. The ability to film practice makes a huge advantage with results. If a player can actually see a positive rep on film, it will drastically help with confidence and the ability to duplicate that repetition come game time. Lastly it is very important to gradually phase your particular drills into individual periods of practice. I would rather have my players be great at phase one drills than mediocre at all four phases. 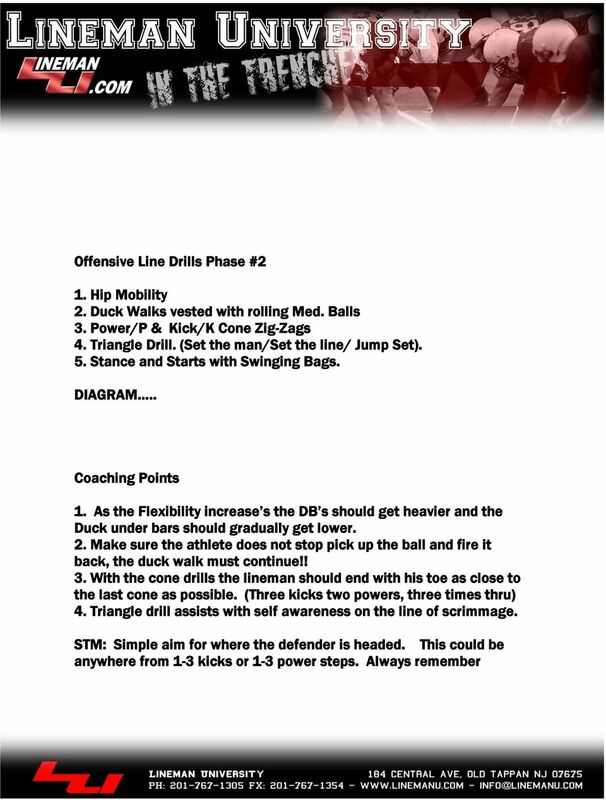 2 Offensive Line Drills Phase #1 1. Hip Mobility Stations (Overhead Box Squats, DB Sumo Squats, Hip Openers) Tight hips will inhibit the ability of your players to play fast with low PAD LEVEL! 2. Duck walks Make sure the arms are locked at 90, knees are slightly bent inward, and that the arm s are tight to the body. 3. Stance and Starts The perfect offensive stances have a 50/50 weight distribution with a flat back. An offensive lineman has to be able to go front back and side to side without FALSE STEPPING! 4. Hand Strikes (Quick Hands on Bags) You can do all the pressing in the gym but if you have a slow punch, you can throw those bench numbers out the window. Make sure with all punch stations that you are not reaching, you want to wait until that defender is up in your grill! Make sure your anchors (feet) are planted in the ground and you are striking with the heal of your hands. Aiming points for the strikes are the defenders NEAR point and FAR pec. 3 5. Power/P Steps With the Power/P s make sure the hips are down, head is up, the steps are replacing base, and most importantly that the power step is moving towards the line of scrimmage! 6. Kick/ K Steps With and Kick/K s make sure the hips are down, head is up, back is vertical, and the player is replacing base. This is phase one of four if you have any questions you can send them to or Make sure you check back soon for Phase #2. 5 weight is inside out HEAVY ON THE INSIDE LEG! 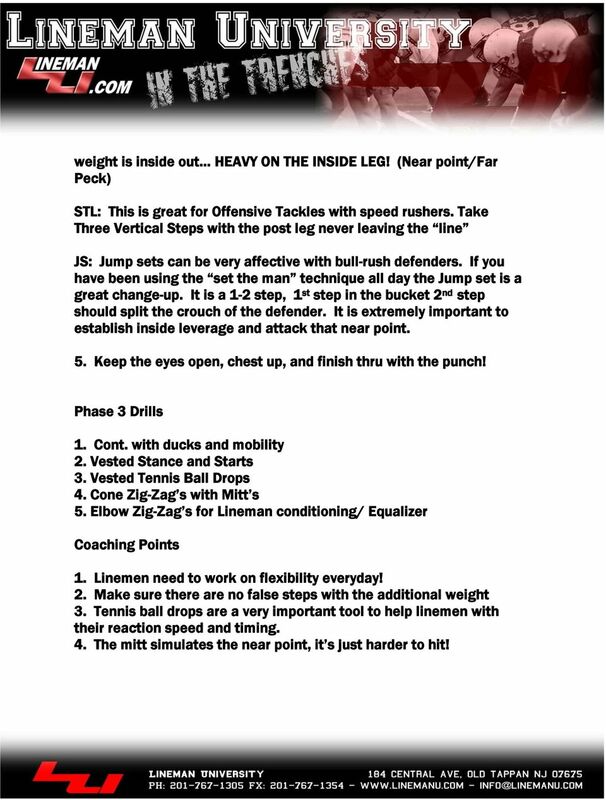 (Near point/far Peck) STL: This is great for Offensive Tackles with speed rushers. Take Three Vertical Steps with the post leg never leaving the line JS: Jump sets can be very affective with bull-rush defenders. If you have been using the set the man technique all day the Jump set is a great change-up. It is a 1-2 step, 1 st step in the bucket 2 nd step should split the crouch of the defender. It is extremely important to establish inside leverage and attack that near point. 5. Keep the eyes open, chest up, and finish thru with the punch! Phase 3 Drills 1. Cont. with ducks and mobility 2. Vested Stance and Starts 3. Vested Tennis Ball Drops 4. Cone Zig-Zag s with Mitt s 5. Elbow Zig-Zag s for Lineman conditioning/ Equalizer Coaching Points 1. Linemen need to work on flexibility everyday! 2. Make sure there are no false steps with the additional weight 3. Tennis ball drops are a very important tool to help linemen with their reaction speed and timing. 4. The mitt simulates the near point, it s just harder to hit! 6 5. Either drill is brutal and teaches balance and leverage. It is hard to simulate live drills in the off-season but these drills are about competitive and great for developing linemen. Phase 4 Drills 1. Pull Stations (Drop Step, Cross-Over, Skip Pull) 2. Push-Pull 3. Tire Battles 4. 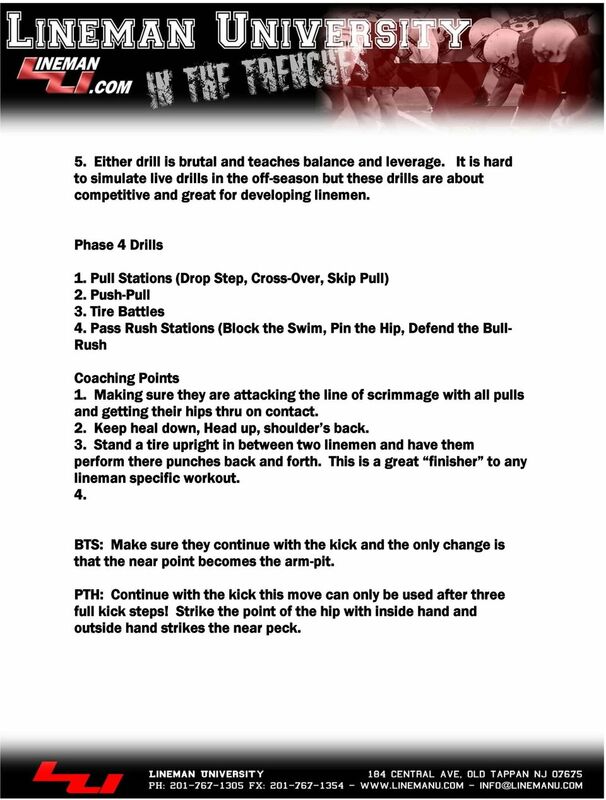 Pass Rush Stations (Block the Swim, Pin the Hip, Defend the Bull- Rush Coaching Points 1. Making sure they are attacking the line of scrimmage with all pulls and getting their hips thru on contact. 2. Keep heal down, Head up, shoulder s back. 3. Stand a tire upright in between two linemen and have them perform there punches back and forth. 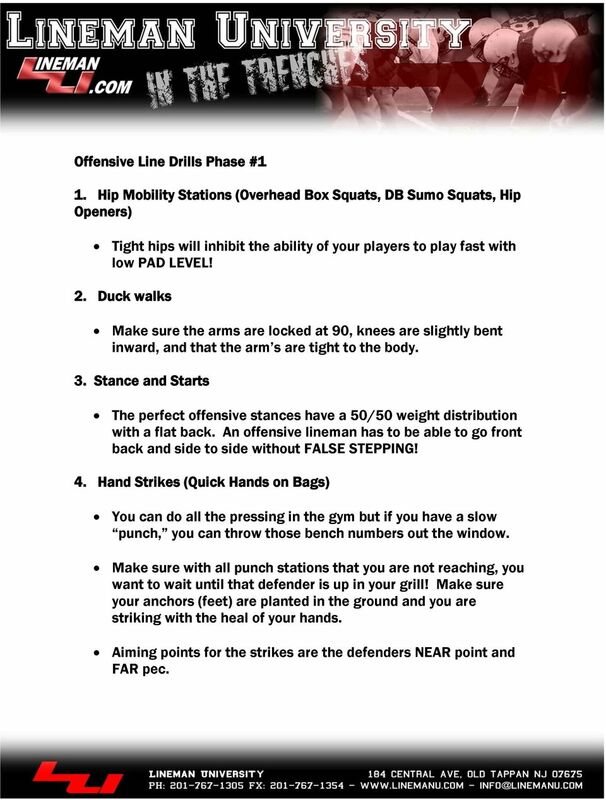 This is a great finisher to any lineman specific workout. 4. BTS: Make sure they continue with the kick and the only change is that the near point becomes the arm-pit. PTH: Continue with the kick this move can only be used after three full kick steps! Strike the point of the hip with inside hand and outside hand strikes the near peck. 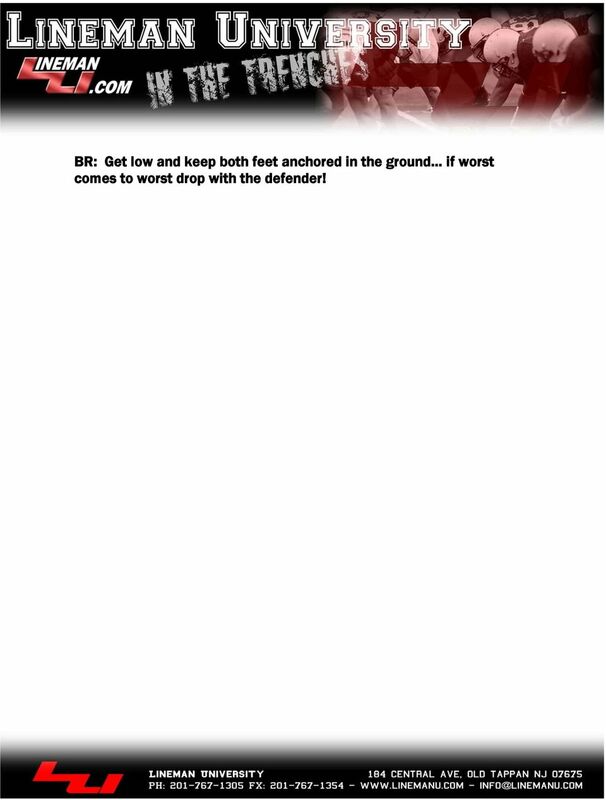 7 BR: Get low and keep both feet anchored in the ground if worst comes to worst drop with the defender! Introduction Interval Training: Movement Emphasis: Overtraining: only amount of time in the gym amount of sweat sacrificed and time with a ball.